Rolling along on with this series on the discipline of study and I must say that this series has taken on a life of its own and is beginning to roar like a lion. I have been incredibly motivated by the previous men I have been able to share some time with who were kind enough to tell me how they put things together. The first post was simply on the importance of having a life of study, the second post was on the unique way that Jeff Arnold does things, and the third post was about Scott Graham who was kind enough to share with me some things that he does concerning study and preaching. I trust that this post today will also be helpful as well as motivating to you who are week-in and week-out preparing your heart and mind to preach the Word. Ben Weeks is a man I wish I would have met 15 years ago. However, it was not in God’s timing that I meet him until October 2006. I had heard him preach once via cassette tape that my cousin, John Padgett, had given to me from a men’s conference that he hosted at his church in 2003 or so. When I heard the tape, I was immediately impressed by the fact that he was well prepared and that he communicated well but his preparation and communication skills did not detract from the feeling of the message that he preached. Little did I know at that time how valuable of a friendship that would develop three years later. I have in times past made reference to Ella Wheeler Wilcox’s poem about lifters and leaners and that all people fall into one of those categories, Ben Weeks falls into the category of a lifter. Furthermore, he is the one of the most disciplined men that I am associated with. Since October 2006 he has increasingly motivated me. I would estimate that we probably talk at least once a week but usually 2-3 times a week. 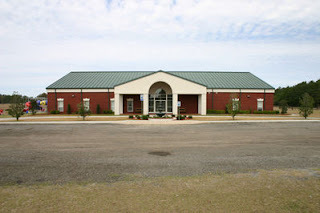 He has been preaching for 21 years and hails from the Vidor Texas area. He started preaching in his early teen years and traveled with his close friend, James Townley, who up until the age of 25 had a significant influence on each other. James Townley now pastors in Louisiana and Ben Weeks pastors Truth Harbor Apostolic Church in Lake Park, Georgia. 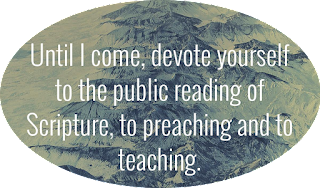 Ben Weeks and I had quite a discussion about study and how he goes about putting things together and I feel certain that you will find some encouragement to “go thou and do likewise” after you read about some of the things he does to prepare to preach. He told me that he uses different approaches in a constant effort to stay fresh with his preaching. He will work through a book in the Bible, a character, or a topic, and even a particular doctrine. With the topical and doctrinal approach he will work his way entirely through the Bible almost taking a systematic theology approach. He also gets a lot of mileage from his devotional time which is an everyday affair. He reads through the Bible every year in a different translation than the KJV and a lot of seed thoughts will develop from this devotional reading of the Bible. Currently on his mid-week services he is doing a series on having a warrior mentality in our relationship with God. He started this initially with the idea of preaching a single message on fighting the good fight of faith. However as it developed it, he realized the differing views of biblical warriors and fighting led to a series of lessons. Currently on Sunday mornings, 1 and 2 Peter have been treated with a verse-by-verse exposition. Ben also told me that as the 1 and 2 Peter series developed that he would incorporate biographical material about the Apostle Peter and there were a few times that he would spend preaching messages about the situations that Peter had to deal with. He also mentioned that sometimes sermons can come from current concerns that he may have about the local church which can be helpful to set direction for the church again. He also mentioned a recent character study on the Old Testament prophets particularly Ezekiel and Hosea. All of the OT prophets had their own special and unique gift. Two things that he does every day: He reads something every day! He writes something every day! There are no vacations or holidays with this discipline. He reads and writes something every day to keep from the habit of last minute “cramming” before preaching. No late Saturday nights or fitful Wednesday afternoons trying to figure out what to do. Because of his discipline in this area, he has 8-12 already developed Bible studies or sermons that he keeps in his Bible which he has never preached. As the service progresses, he is constantly seeking the direction of the Lord for which avenue to take. He told me that recently he had worked through a message from Obadiah and had been holding it for about 3 months. The tone of the service led up to him taking this message and preaching it then. It turned out to be a good blessing not only for the church but for him also. Inspirational -- This is comprised of old sermon books by G. H. Morrison, Clovis Chappell, Harry Emerson Fosdick, and others. As for newer material, he has the series by Charles Swindoll Great Lives From God’s Word (Moses, Paul, Job, Joseph, David, Jesus, Elijah, Esther, & Fascinating Stories from Forgotten Lives). Motivational -- This genre is comprised of writers like Zig Ziglar and John Maxwell. Although concerning Maxwell, he has discovered it is a lot of pop psychology/leadership matters that will be obsolete ten years from now. The motivational books are primarily to encourage resilience in life because everyone you meet is walking through some sort of mire. Everyone has tough times and dark days. The motivational books also can provide good sermon illustrations. Educational -- This is history, science journals, and biographies. Much can be gleaned from history. In fact, he has read through Will Durant’s massive tome entitled “The Story of Civilization” which is an eleven volume set of books. He read through this set by reading 10 pages a day and then he would put it down. It took a while to do this remarkable feat but he made it! He told me that he had heard preachers scattered about the country who mentioned this set of books and so he decided to purchase the set. After purchasing the set, he found out that Pastor Ray Brown from Arizona had read the entire set and this caused him to settle into the discipline of reading through it. Ben’s reading patterns have changed after he became a pastor. Prior to being a pastor he was an evangelist on the road and he would have more time to read. Over about an eight year period he would read 150 books a year averaging one about every 2-3 days, now he only reads about 50 books a year. I told him that he still reads a vast amount of books in comparison to a lot of people. Every preacher has to know and understand his life must be a life of study and prayer and part of the area of study is reading good things that build the mind and heart. Ben also receives book recommendations from a few friends and he does what I do when we go into bookstores. We both “troll.” That is you start on one side and sort of quickly browse through and judge books by their covers and pick up and read what catches your interest. As mentioned earlier, he told me that a single sermon sometimes needs to take on a life that goes beyond just one time being preached. The same points needs to be re-iterated over and over again. This is a great quote that Ben mentioned to me during the phone call: Repetition is the mother of skill and repetition is the key to mastery. The pastor must continually repeat and reiterate the principles of the Kingdom of God. All of his sermon notes are handwritten as he does not use a computer to type out his notes. The handwritten notes come in two formats: a complete manuscript or a detailed outline. The discipline of writing out his sermons and Bible studies over the years has helped to put his thoughts into concrete ideas. I asked him who had been the major influencers in his life as preachers. Jeff Arnold told me that he listened to a lot of George Glass tapes in his early years. Scott Graham stated that Jerry Jones and Mike Williams had influenced him. Ben told me that there were three distinct men who had helped him as a preacher. Again, the relationship that Scott Graham mentioned about his nervousness and intimidation toward Jerry Jones was expressed by Ben Weeks concerning the three men he looked up to. Again, I will refresh your memory from yesterday’s post, “Who your heroes are will be who you become later in life.” Ben told me that as he got older he developed a good friendship with all of these men. Larry Booker -- He met Brother Booker in 1992 after he had just turned 20. Brother Booker had a big impact on him simply because he saw him as a “giant” to follow after. His preaching challenged, convicted, educated, and fed him. He told me that it was obvious that Brother Booker was very educated concerning biblical themes and his ability to pull in illustrations to preach were inspiring. Brother Booker became a goal that he started reaching for. Johnny Godair -- Brother Godair was a man who was very motivational and would challenge men to accomplish great things for God. 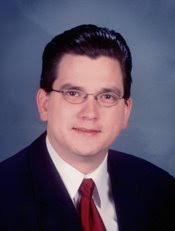 Jonathon Alvear -- Brother Alvear was a man whose sheer preaching ability was very inspiring and insightful. He always had the ability to bring Scripture to a greater height when he heard him preach. Another important influence because of his personal devotion, disciplined prayer life, and self-sacrifice was Pastor Joel Holmes of Little Rock, Arkansas. As for peers who have influenced him, he mentioned Jason Calhoun (whom I am going to spend some time blogging about in a few days for his methods), Steve Pixler, James Townley, and ol’ Barnabas (that would be me). I have also discovered that preachers need preachers. We have massive capabilities with on-line MP3’s and CD’s that many from past generations did not have available to them. Just as Scott Graham mentioned listening to preaching, Ben Weeks also does this. In fact, he and I have worked together very diligently converting old cassettes into MP3’s and then passing them on to each other (along with Jason Calhoun in Texarkana, TX). Ben averages listening to 5-7 sermons a week and sometimes when travelling he may listen to more. To allay some readers fears, most preachers (at least the ones I am associated with) rarely listen to another preacher with the intent of “re-preaching” that message. Ben and I both listen to other sermons to pull what he called “sermon spice” (I like that term) which is illustrative material to add to a message you are about to preach. As for listening to messages, Ben told me that sometimes it is a spark that will push you down a trail to develop a message. About one time out of a hundred, he will take a message and preach it to his church but he tells them that he heard another man preach it and he is going to use it because it was a blessing to him. When I asked him who he listens to he gave me the following names: Larry Booker, Johnny Godair, Jonathon Alvear, Nate Wilson, Jerry Jones, Scott Graham, Philip White, and Randy Keyes. As far as one sermon that really stood out in his mind that he had heard over the years was one that came from the PSR conference well over 20 years ago. It was a message that Randy Keyes preached “When Moses Met Jannes and Jambres.” This is probably a classic message among us and I heard the same message preached at Because of the Times sometime around 2002-2003 or so. Ben told me that the old PSR (which I think is now the West Coast Conference) conference had a big impact on him in the late ‘80’s and early ‘90’s although he was not able to attend until the mid-90’s. However, every year he would purchase the cassettes and listen to them over and over again. He told me that the impact of Vaughn Morton, Larry Booker, Nate Wilson, Randy Keyes, and Ken Bowe all had a significant shaping force in his life. When I asked him about the total time average that he would spend with a putting a message together, he said it ran probably in the 8-10 hour range. That includes the gathering, researching, reading, and praying aspects of putting the message together. If preaching is going to be effective then it has to have a wide range of interest about it. 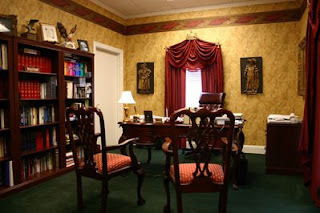 This is where the reading habits of the preacher come into play. He prefers to study in the mornings but sometimes this has to be changed up as pastoral demands usurp that time frame. Ben told me that years ago he read something about the “power of five minutes.” He read this from book written to executives concerning the use of time and how that at every moment of “downtime” which is concerned with waiting and so forth that a book can be read or thoughts can be jotted down in a notebook. 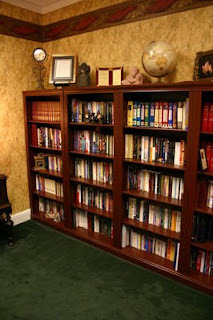 Next he discussed the importance of having a good personal library. 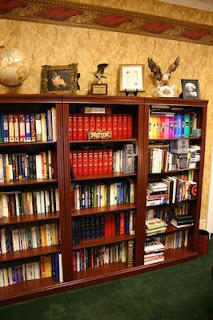 He has around 5,000 volumes that are split between his home study and his study at the church. I learned something from him concerning writing in your books. His books are full of notes, observations, and random thoughts that he will write with a pen in the margins and the front and back covers of the book. He will place an exclamation point by a key point and then at the top of the page he will write words like faith, doctrine, prayer, perseverance, and so forth. Then he will take a sheet of paper and place it in a filing cabinet under a particular subject that it fits under for future use. You can listen to the sermons of Ben Weeks and download them if you choose to do so. I very much appreciate this series on the "Discipline of Study". Some very remarkable ideas have been presented. Thank you. Glad to see you blogging about my friend. His preaching blesses me and his life challenges me every time we are together. Thanks for these blogs. I appreciate every nugget that is gleaned here. Thanks so much for these threads. My pastor turned me on to them and now I'm hooked. Excellent blog. Thanks for posting. A tremendous amount of "usable" information contained here. Please keep this series going. It is proving very inspiring to me as well as many others. This series is very much appreciated. I admire the discipline that is evident in the ministries covered here. Keep it up.